Win 2 Tickets to NY Comic Con 2016! Pete and Ramon and Penny are kicking off the Halloween season early with a whole slew of zombie books to talk about that center around George Romero's original Night of the Living Dead from 1968. Ramon tells Pete he missed out when he didn't read Dark Horse's Paybacks, which pokes fun at superheroes and there (expensive) gadgetry. And speaking of gadgets, the future is a total technocracy in Tokyo Ghost. This was an odd one that the Crew had a lot of fun with. We announce the winner of our Legendary Zelda Giveaway! Pete and Ramon go through a short list of books as well as some breaking news about Marvel and Fox on this July 4th episode. Image's U.S. vs Canada war book We Stand On Guard is off with a bang. Ramon is on board for Marvel's Princess Leia. Pete is getting into Battleworld Red Skull #1, and is happy to see The Spirit back. Kick off your July 4th with a little comic book talk from Brooklyn, NY. Get to downloading right now! We kick off our Legendary Zelda Dark Horse giveaway! Pete and Ramon are back with two weeks of books to talk about, some good some not so good. Snake Eyes is dead, but will he rise again or is he gone for good? Order of the Forge continues to revolutionize the Founding Fathers. Pete's got some interesting opinions about Spider-Man Renew Your Vows. Broken World is off to a smashing start. Providence is not what it at first seemed. Mutanimals and Groot are surprize hits with the boys. Don't delay! Let's talk comics and win some cool Zelda stuff! Start downloading now! $250 Midtown Comics Gift Card Giveaway! We're giving you another chance to keep your holiday season GEEKY! One lucky winner will get a $250 Midtown Comics gift card. That buys a lot of comic books! Check out the Rafflecopter entry form below for instructions on how to enter and win! We've got Marvel's Mega-Event-Filled 2015 to talk about! We've got Marvel Studios' movie schedule to geek out over! AND of course, we've got lots of comics to review! The Big Two take a back seat as the boys go over a whole bunch of number 1's from the smaller publishing houses like Black Mask, Avatar, and HP, that you need to be checking out! Plus, we're giving away an awesome Iron Throne statue from Dark Horse and Game of Thrones! Make sure you check out this episode, as well as the accompanying Pete's Basement Extras premiering this week, so you don't miss any of these great comics! Get your cosplay on and you can win 4 Day passes to New York Comic Con. 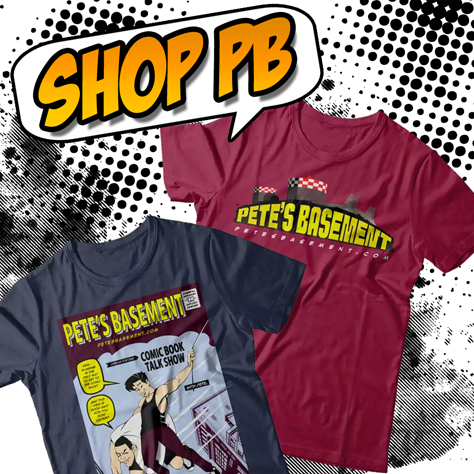 Pete's Basement is happy to take part in this awesome giveaway hosted by InvestComics.com. We'll be one of the teams judging your entries and picking a finalist, along with InvestComics, Zap Kapow, and Nerd Fu. Head on over to their site for the official rules, then get to posting your best cosplay pics! What are you waiting for? Good luck!